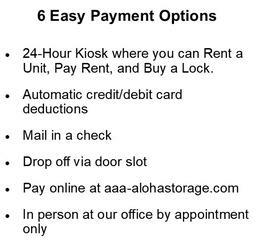 AAA Aloha Storage provides clean, affordable and secure storage units for your personal items and/or commercial needs. We offer daily access from 6:00 AM to 8:30 PM. All students are welcome, including students from the University of Notre Dame and Saint Mary's College. 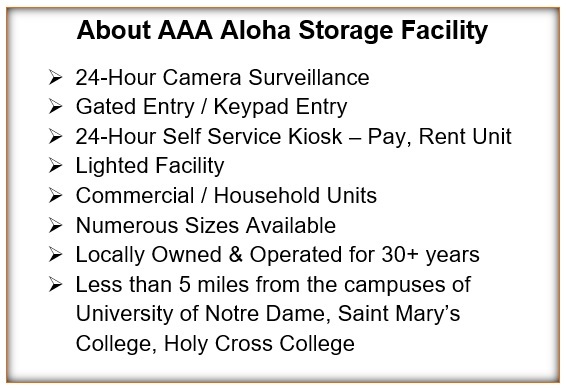 AAA Aloha Storage is located just five miles straight north of the University of Notre Dame and Saint Mary’s College. We are proud that many of our clients have used AAA Aloha Storage for over 20 years. We are one of the top choices for self storage units in the Niles, MI / South Bend, IN area thanks to our commitment to customer service and security. 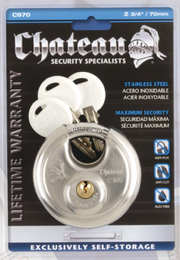 Affordable self storage is a promise. We offer month-to-month leases, keypad entry, climate control units, large truck accessibility, 24-hour payment rental kiosk, vehicle storage, and a multitude of other services for anyone looking for self storage in Niles, MI or South Bend, IN. Please call us for our seasonal rate specials, or to speak with a courteous staff member. Office is Closed. Please use our Kiosk.